The latest Pinterest study, published by the social media analytics provider quintly, reveals Pins which received the highest amount of shares in Q3. 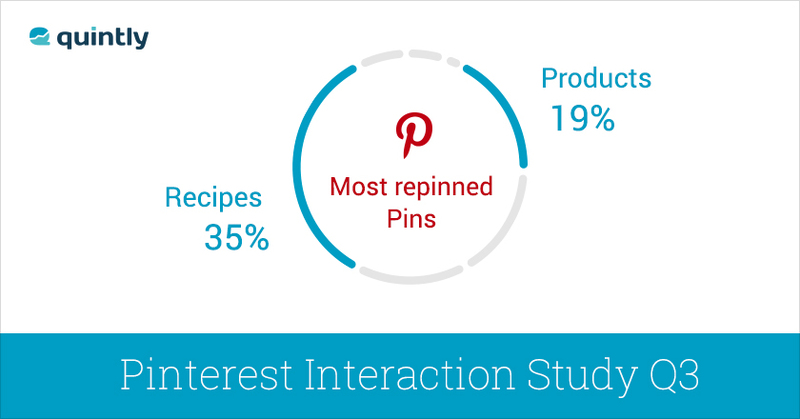 ‘Recipes’ and ‘Product Pins’ outperformed other Pin-types such as “Regular” and “App” Pins in the average amount of shares (re-pins). As well as that quintly shows which Pins are published by brands most frequently. Knowing that, marketers are able to check their own posting patterns and adjust their own strategy to achieve more re-pins and thus amplify their reach. As the lifetime of a Pin is considered to be more than three months (compared to Twitter 24 minutes) it is essential to know how to achieve a higher amount of shares on Pinterest for a sustainable long-term strategy. The metrics chosen by quintly focus on the essential numbers for marketing on Pinterest. As quintly analyzed more than 200 major brands, readers get a good view into the strategy of the most successful players on Pinterest. Pinterest is known as a huge traffic driver in E-Commerce and this study helps brands adjacent to this sector to benefit from the visual social bookmarking service. After launching Pinterest Analytics three weeks ago the social media analytics provider published the second Pinterest study, showing the capability of its own Pinterest analytics. For more information or a free trial please visit: https://www.quintly.com/pricing/.